The OGESDW.DOL.GOV link is the Department of Labor’s enforcement data website which houses investigations conducted by the various Government Agencies who enforce Federal labor laws; (OHSA, MSHA, WHD, EBSA, OFCCP). The tables included on the site show organizations that have been found to be compliant in addition to ones who were found to have the various forms of identified violations (e.g. financial settlements). The EEOC’s newroom houses current and past legal cases in addition to articles regarding lawsuits or settled with various organizations covered under Title VII. 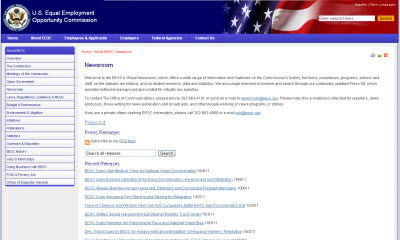 This link also offers news updates related to current and recent actions the EEOC is involved in. Every organization should periodically review the material and take steps to ensure that their organization is not vulnerable to the types of violations/discrimination discussed on the site. Ensure selection criteria do not disproportionately exclude certain protected classes unless the criteria are valid predictors of successful job performance and meet the employer’s business needs. For example, if educational requirements disproportionately exclude certain minority or racial groups, they may be illegal if not important for job performance or business needs. When using an outside agency for recruitment, make sure the agency does not search weed out candidates of a particular protected class. Both the employer that made the request and the employment agency that honored it would be liable.